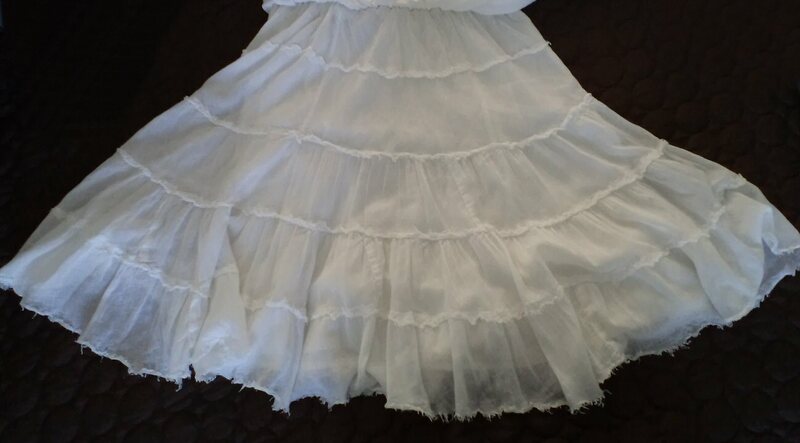 My one and only white skirt! The skirt that you see here is one of my favourite summer time items. (Yes, I know, it resembles a petticoat; just wait 'til you see what I do with it.) I'm sure I've had it for over fifteen years; the repeated washings over that period have made the light gauzy material even more gauzy and almost transparent (even though it's lined). It's got an unfinished bottom edge to it that I've always liked, and the tiers have seams that are exposed and similarly "tattered". Over the years, the elastic at the waist has lost its elasticity. I've actually had to cut into the casing to tie off a section of the elastic to make it work. Still, I've been wearing it regularly and absolutely refuse to toss it. You see, I have many skirts, but this is my only white one. And sometimes there's just nothing like wearing white in the summer. 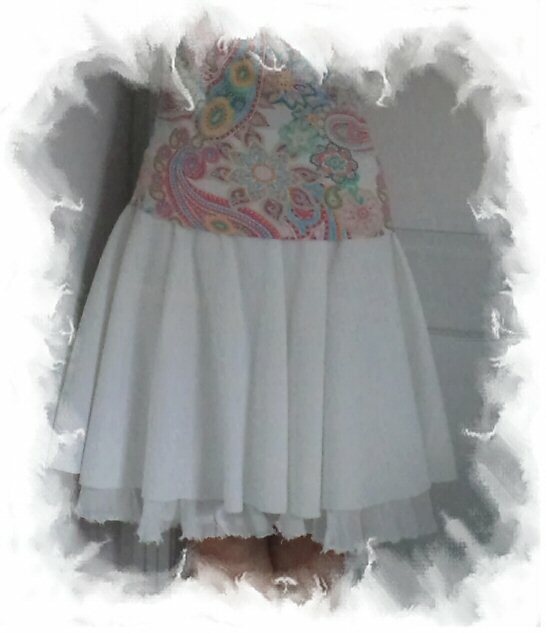 Which is why, when I picked up this white fabric from our neighbourhood garage sale last year, I decided that I was going to make a skirt out of it. Over a year later, I finally have an idea to use the fabric to perk up this skirt. I also have this stretchy lace belt that I picked up for under two bucks on eBay several years ago. While wearable, it's always been just a tad too small for my liking. My idea is to use it as the waistband for my remade skirt. 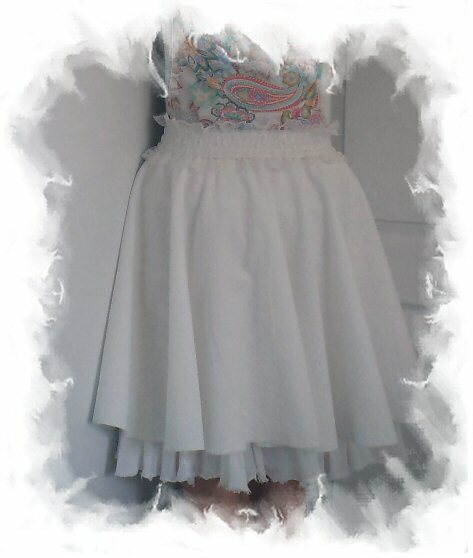 This is a circle skirt, by the way, so I searched online for a circle skirt tutorial. Found several, but used the one at Made Every Day with Dana, originally posted in 2008. The length of my skirt — since I wasn't going to finish off the bottom seam — is 17.5". I removed the hardware from my elastic belt and used a couple of small pieces of elastic to add some extra length (width?) to the whole waistband. Since this has to pull up over my hips, the elastic from the belt by itself is not enough. What I did was zigzag-stitched together the two pieces of elastic, trimmed the resulting piece to the same 2" width as the belt elastic and then attached it to the belt to create the waistband. I surprised myself... the two parts actually fit! Next, I removed the elastic from the old skirt and unpicked the stitches that formed the casing. Then I pinned my new circle of fabric over top of it and basted both parts together. Then I got so busy putting it all together that I stopped taking pictures! A new look for an old skirt! Now that I have an extra layer of fabric on this skirt, I no longer have to worry about what colour underwear I'm wearing... LOL! I actually had to remove a tier from the bottom of the original skirt; too much of it was showing and it did not look right. It took me over a half an hour to unpick those stitches! All in all, I'm quite happy with the results of this skirt makeover. There is, however, the matter of that part of the waistband that isn't covered with lace. I've thought about buying some lace to add to it but that's such a small amount. I have this butterfly applique that I can sew on, but I don't know about that either. Any ideas on how I might finish this last bit of my remade skirt? By the way, this is the first of a few clothing-centric posts that I am going to put up over the next month or so. I actually have extensive experience sewing clothes. But apart from hats and slippers and scarves — I really haven't written anything here about sewing stuff to wear. It's time to share some of that.